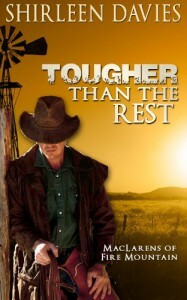 'Tougher Than the Rest' is a memorable western romance set in Arizona in the 1800's. After four kids suffer the tragic loss of their parents, we’re taken twelve years into the future where they are grown up and trying to find love and what they want to do for the rest of their lives. Niall came off as really cold most of the time, as he was still recovering from the loss of his wife, Camille, and has the responsibility of keeping his family afloat. Although attracted to Kate, he sees her as an obstacle to putting his life on the financially stable track he intended by marrying a wealthy widow. There is a lot of attraction and tension between these two, as Kate wants Niall close, but he’s hard-headed and refuses to change his mind. Shirleen Davies really pulls you into Kate's and Niall's world with these strong main characters and secondary characters. I felt like I was in their world throughout the whole story as well, which is a testimony to great writing. I can't wait for the next book!